Nurses and supporters picketed outside United Hospital in St. Paul. Nearly 5,000 nurses employed by Allina Health began a seven-day strike this morning, setting up picket lines outside five metro-area facilities. 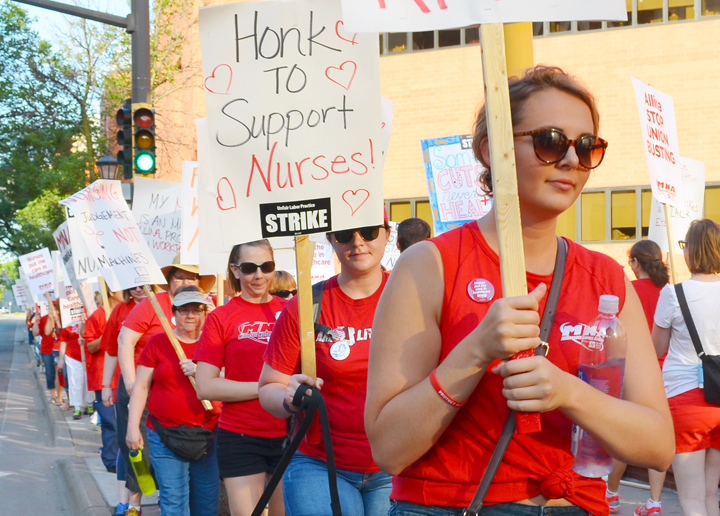 In downtown St. Paul, well over 200 nurses and their supporters blanketed the sidewalk outside United Hospital in red, the Minnesota Nurses Association’s official color. Picketers put up cheers as nurses finishing the night shift walked out of the facility and onto the strike line. “To see this many nurses on the outside, you know something is wrong on the inside,” United labor and delivery nurse Christine Hicks said. Nurses are standing together to defend their affordable, quality health insurance plans. Since contract talks began in February, Allina has refused to budge from its demand that nurses give up four union-sponsored insurance options and transition into “core” plans that cover most of Allina’s other employees. In response, the union filed charges of unfair labor practices with the National Labor Relations board. Under federal law, union members can engage in an unfair labor practice strike without fear of retaliation. The nurses’ employment is protected under federal law. Nurses are also on strike at Unity, Abbott-Northwestern and Mercy hospitals, as well as Phillips Eye Institute. Supporters are welcome ­– and appreciated – on the picket line, according to the union. MNA has posted a sign-up form for picketers at allinastrike.com. Nurses are also asking supporters to sign onto a petition asking to Allina to drop its efforts to shift $10 million in health care costs onto nurses and their families. The petition is online at nursesneedcare2.com.